Many farmers and gardeners grow cut flowers for retail garden centers, roadside stands, farmers markets and farm shares in Massachusetts. Proper harvesting and care of flowers after harvest are important to maximize the vase life and ensure a high quality product. Below are some tips for proper harvest and care of cut flowers. Maximizing the vase life of cut flowers is dependent on pre-harvest procedures too. Long before harvest, plant cultivar selection should be considered for postharvest longevity to provide the best possible cultivars for cutting. The weather conditions and plant environment also affects the postharvest longevity. For example, heavy rainfall can splash soil onto plant stems causing a greater risk for microbial contamination and blocked stems after harvest. It is also important that plants are not water-stress prior to harvesting flowers. Plants should be healthy and properly watered before cutting flowers so that the cell walls are turgid. It is important to know the optimum stage of harvesting for each plant species to ensure the quality of flowers after harvest. For maximum vase life of cut flowers, harvest flowers daily at their proper stage of development. Harvesting too early or too late significantly reduces the vase life of the flowers. If harvested after the optimum stage, the developing flowers use the carbohydrates that will be used for the development of smaller flower buds, thus, slowing down the growth of other flowers. Each plant species has a minimum harvest maturity stage in which flowers can be harvested without affecting their postharvest quality. Flowers of some plant species can be harvested at the bud stage with no reduction in quality and vase life. For other plant species, disorders such as bent neck, improper development of pigmentation, or abnormal opening of the buds can result when flowers are harvested when they are too immature. If flowers are to be stored or shipped long distances, then they are usually harvested at an earlier stage. Spike type flowers: Harvest when one-fourth to one-half of the individual florets are open. Daisy type flowers: Harvest when fully open. A chart containing a list of commonly grown cut flowers and optimal development stage is available from the fact sheet “The Care and Handling of Cut Flowers ”, Oklahoma Cooperative Extension. Plants should be healthy and turgid. White plastic buckets and cutting tools (knives or shears) should be cleaned and sanitized. Avoid stacking buckets if the outside is not as clean as the inside. Cutting tools should be sharp. Dull cutting tools can result in crushed stems that reduces water uptake. Buckets should be cleaned and disinfected regularly. Dirt harbors bacteria which clogs the stems of cut flowers. Wash buckets thoroughly using a low-suds biodegradable detergent, rinse in clean water, and give a final rinse with a solution containing 1 ml (0.2 tsp) Clorox (5% hypochlorite) per liter (about a quart) of water, preferably every time the bucket is used. Note that dirt can be easily seen in white buckets vs dark colored buckets. All buckets for harvesting should contain clean water. Many growers also add a biocide to the water. Biocides are chemicals that prevent the growth of bacteria, yeasts fungi and other microorganisms and are commercially available. Microorganisms and the substances that they produce can plug the xylem (water conducting tissue) of the plant, thus blocking the uptake of water. Researchers have shown that there is a strong inverse relationship between the number of microbes in the water and the Iongevity of cut flowers. Common biocides are calcium or sodium hypochlorite (bleach), aluminium sulphate, and salts of 8-ydroxyquinoline. Regular household bleach is very short-lived (+/- 4 hours) compared to commercially available slow-release chlorine tablets (about 2-3 days). Many growers use slow release chlorine tablets (Dichloro-s-Triazinetrione Hydrated) in the water at time of harvest. It is important to follow the company’s recommendation for the correct dilution rate of the biocide for the specific flowers. In addition to biocides, the pH of the water should be acidified to 3.0 – 5.5 as researchers have demonstrated that flowers absorb more water in acidic solutions than those at higher pH levels. Chemicals such as citric acid, 8- hydroxyquinoline citrate, or aluminum sulfate are generally used to lower the pH of the water. The amount of chemical needed will depend on the alkalinity of the water. Alkalinity is a measurement of the amount of calcium and magnesium carbonates in the water. Water with high alkalinity is highly buffered and will require more chemicals to lower the pH. The pH and the alkalinity of the water source should be analyzed to determine the proper amount of chemical needed to lower the pH to the desirable level. Water testing can be done through a public or private laboratory. High levels of sodium (Na), fluoride (F) or sulfate (SO4) can be toxic. Avoid using chemical water softeners in any stage of cut flower storage. Biocides and preservatives are generally not approved for certified organic production. Organic growers are advised to check with their certifying agent. It is important that certified organic flower growers practice excellent sanitation and harvest at the proper stage of development to ensure maximum vase life for flowers. Harvest in the morning or evening. Remove foliage on stems that will be below water. Slant cuts will keep stems from lying flat on the bucket bottom and increase water uptake. Never lay flowers on the ground or dirty surface. Disinfect cutting tools frequently, or at least 2 times each day. Grade and bunch flowers immediately after harvest. Bring flowers into the shade and place in clean buckets of clean warm water (acidified) and a biocide. Flowers should be harvested in the morning (after dew has dried) or evening, not during the heat of the day. Ideally, flowers should be harvested in the morning when temperatures are low and plant water content is high. Make cuts to the plant to obtain long, sturdy stems. Remove the foliage on the stems that will be below the water which will decay and encourage bacterial growth. Some flowers such as sunflowers benefit from removal of most or all of their foliage. Also, for some flowers, side shoots on the main stem are often removed at the time of harvest. Stems can be cut on a slant or straight (square). Slant cuts will keep stems from lying flat on the bucket bottom and increase water uptake. Flowers are often graded and bunched immediately after harvest and before placing them in water. This practice reduces handling steps and minimizes mechanical damages that often occur on the flowers and leaves. If grading and bunching cannot be done immediately, then flowers should be placed in clean buckets containing clean warm water (acidified) and a biocide. Warm, acidic water reduces air bubbles. Avoid over-filling the containers with flowers to prevent bruising and tangling. The depth of the water in the buckets should be deep enough to cover the bottoms of the stems, usually 1-6 inches depending on the size of the stems and buckets. During harvest, some growers place buckets at the end of the rows where they place flowers as they cut. Flowers should never be placed directly on the ground or laid on dirty surfaces where they can collect dirt and contaminate the stems and buckets. Flowers and foliage stems should always be kept clean. In addition to clean buckets, cutting tools should be regularly disinfected. Some growers place a bucket containing disinfectant solution and clippers at the end of the row to encourage harvesters to easily exchange used tools for clean ones as they finish a row. It is best to harvest small quantities at time and bring them into a cool area and place them into the prepared buckets. Buckets placed under portable tents or patio umbrellas work well to create shady areas and reduce heat in the field. A shady area lowers the temperature, reduces water loss and respiration rate of the flowers, and therefore increases the postharvest life and quality of the flowers. Move flowers to a cool area. Place flower in solutions depending on the need of the flowers. After harvesting, flowers are then moved to a cool area where stems can be recut and placed in solutions depending on the specific need of the flowers. Once harvested, flowers continue to transpire and will wilt rapidly. Most flowers will fully recover from wilting if recut and placed in a warm, rehydration solution. Stems are recut by removing about an inch of the end of stems under water prior to placing them in their solution. This helps prevent air bubbles in the water conducting tissue. Air bubbles reduce the uptake of solutions. Always treat flowers before they are sleeved to hasten uptake into the stem. Proper temperature management is an important factor for maintaining the quality and vase life of cut flowers. As storage temperatures increase, respiration and water loss increases and wilting occurs. It is important to cool harvested flowers to remove field heat. For convenience only, flowers to be sold on that same day can be placed outdoors. Those intended for market at another time should be moved to a cooler as soon as possible with temperatures as close to 33F (most flowers), 41-43F (some flowers such as zinnias and gerberas) or 50F (chilling sensitive flowers) in order to best preserve quality. The best practice is to harvest flowers at their optimum stage and store them at the lowest possible temperature you can provide without causing freezing or chilling injury. For sales in retail garden centers and farm stands, all handling and sales should be conducted in a shady area (as cool as possible). Generally, the lower the temperatures, the longer the flowers last. Most flowers will retain their quality if stored at temperatures near the freezing point (33F). Others, such as those originating from subtropical and tropical regions, develop chilling injury if stored at temperatures below 50F. Symptoms vary depending on plant species and may include darkening or water-soaking of the petals and death of flowers. Flowers such as anthurium, bird-of-paradise, heliconia, certain orchids, as well as others that are susceptible to chilling injury are best stored at temperatures above 50F. Relative Humidity is another factor that affects uptake of solution. There were several recommendations in the literature for suggested relative humidity ranging from 75% to 99%. High relative humidity reduces transpiration and keeps flowers from drying out. Buckets and water used for cut flowers should be clean, buckets disinfected regularly and biocides (unless organic) be added to the solution. Replace the solution often to avoid allowing the solution to become cloudy, which indicates of the presence of high counts of microbes. Dirty water contains bacteria that will prevent uptake of water. Another important factor is the specific ions contained in the water. Water quality that is good for human consumption may not be good for cut flowers. For example, fluoride in fluoridated municipal water is very toxic to flowers such as gerbera, gladiolus, and freesia and significantly reduces the vase life of these flowers. Water softeners and water containing high levels of sodium and iron are also toxic to some flowers and should not be used. Once harvested, cut flowers are typically placed in a low light or dark environment where photosynthesis is at a minimum. Photosynthesis is a biological process forming carbohydrates (from CO, and H2O in the presence of light), and carbohydrates are needed for the cut flowers to continue to develop. Much of the carbohydrates needed come from starch and sugars stored in the stem, leaves, and petals but the levels may not be adequate. Hydrating solutions: After harvest, hydrating solutions are used to facilitate water uptake and restore the turgor of wilted flowers. Hydrating solutions are usually warm water (110F) with a biocide (such as slow release chlorine tablets), acidified to pH 3.5 to 5.0 with citric acid and include a wetting agent. Hydrating solutions are used immediately after harvest and are usually used for a short time, for example four hours. Some growers use hydrating solutions in the field to help prevent flowers from wilting and to restore wilted flowers. Examples of wilt sensitive flowers include veronica, asters and zinnias. Holding solutions: In addition to a biocide and acidified water, holding solutions also contain a carbohydrate source (sugar) to encourage bud opening and flower longevity. Holding solutions are usually used after the hydrating solution for several hours for up to two days. Depending on the intended use of the preservative, the concentration of each ingredient may vary. For example, a preservative formulated for hard water will contain more citric acid or other acidifiers than the general purpose formula. Many, but not all cut flowers benefit from a solution containing 1 to 2% of sugars and a dilute biocide. Vase solutions: (also call flower preservatives) often contain higher concentrations of carbohydrates than holding solutions and are used by the consumer. If no commercial preservative is added to the water, it is at least necessary to use clean buckets and clean water. The next level of improving postharvest care would be to include a biocide such as a solution of 50 ppm bleach (mix three quarter teaspoon of bleach to 1 gallon of water) or preferable slow release chlorine tablets and an acidifier to acidify the water to pH 3.5 to 5.0. Always test the solution on a few stems before placing all flowers in the bleach solution, as some species develop phytotoxicity from the treatment. Flowers vary in their need for postharvest solutions. For example research at North Carolina State University (NCSU) showed that Eucomois ‘Sparkling Burgandy’ had the longest vase life, up to 43 days in just plain water. The vase life was reduced to 34 days when using holding preservatives; and the use of hydration solution resulted in a reduced vase life of 19 days; and the use of both hydration and holding solutions resulted in the shortest vase life of 11 days. Of 14 cultivars of sunflowers tested, most had a vase life using floral preservatives of 8-11 days. The cultivars ‘Sunny’, ‘Terra Cotta’ and ‘Sunbright’ lasted 14 days. Sunflowers ‘Solara’, Sunrich Orange’ and ‘Premium Lemon’ had vase lifes of 10-12 days when stems were first placed in hydrating solution, then holding solution. The vase life for Hydrangea ‘Limelight’ averaged 11 days, minimum vase life was six days. Treatments did not make a difference in the study. Lysianthus ‘ABC Lavender’ treated with both hydrator and holding solution had the longest vase life of 14-16 days and shortest vase life occurred with stems treated only with water (vase life 5 days) and seven days when a preservative was used. Ethylene, an odorless and colorless gas, is a natural plant growth hormone that affects many physiological processes ranging from seed germination to senescence of plants. Flowers generate ethylene as part of the normal aging process. Ethlene is also produced by ripening fruits and vegetables, exhaust fumes, industrial smoke, tobacco smoke and micro-organisms. To maximize vase life of flowers, it is important avoid storing flowers with fruits and vegetables. Certain cut flowers are very sensitive to ethylene and very small amounts (levels as low as twenty parts per billion) can be very harmful. This level of ethylene is common in supermarkets and in the atmosphere of large cities. Responses to exogenous ethylene vary with species, and include abscission, abnormal development of the flower buds, failure of the buds to open and death of the flowers. Common ethylene sensitive flowers are delphinium, Asiatic lilies, snapdragons, aconitum and sweet peas. In addition to cut flowers, some cut herbs that are being used as cut flowers are also sensitive to ethylene. Marjoram, mint, parsley and oregano showed leaf yellowing and leaf abscission when exposed to ethylene while sage, thyme, basil and rosemary were minimally affected. (Smith, 2015). It is thus important that flowers and greens used for cut flowers that are sensitive to ethylene be handled in areas devoid of ethylene contamination. Commercial treatment products to prevent the effects of ethylene by susceptible flowers include silver thiosulfate (STS) and 1-Methylcyclopropene (1-MCP). Flowers that respond to STS pulse treatments include aconitum, agapanthus, anemone, alstromeria, asiatic lilies, astilbe, campanula, carnation, delphinium, dendrobium, eremerus, freesia, gerbera, gladiolus, goldenrod, gypsophila, kniphofia, phlox, physostegia, roses, scabiosa, snapdragon, stock, sweet pea, and sweet william (Prince and Tayama, 1988). STS solutions require special care in disposal and STS is not registered for use in MA. 1-MCP is used as a gas and is registered for use in MA under the trade names Ethylbloc and Ethylbloc Sachet (2016). See the product labels for more information. Typically, accumulation of ethylene is minimal in well-ventilated areas, making these spaces suitable for the handling of flowers. However, if flowers are handled in a closed environment, then, it is important to minimize contamination. Flower stems naturally bend away from gravity and this phenomenon is called geotropism. Flowers such as gladiolus, snapdragon, gerbera, tulip, and anemone bend upward when placed horizontally. This bending of the stem away from gravity results in curved stems when they are later placed in a vertical position. These flowers should be handled upright whenever possible. Mechanical damage to the leaves and flowers reduces the aesthetic value of the flowers and bruised petals and leaves are more prone to infection with disease organisms and ethylene production. The quality of cut flowers is best maintained with gentle and minimal handling. Cut flowers are susceptible to the fungus disease botrytis, which will cause flowers to turn black and decay. Botrytis has ranges of temperature and relative humidity that are necessary for spore germination, infection and disease development. Spore germination and infection depends on a film of moisture for 8 to 12 hours, relative humidity of 93% or greater, and temperatures between 55-65F with colonization of plant tissues occurring at temperatures up to 70F. Management: Botrytis can be managed by proper environmental management. To prevent botrytis, avoid harvesting and storing wet flowers. Also, avoid moving flowers directly from cool to warm rooms which results in water droplets forming (condensation) on flowers, leaves and stems. Maintain dry floors in areas where flowers are processed. Do not dump buckets of water or hose down floors. Wet floors will increase relative humidity and increase the risk for botrytis infection. Armitage, A. 1991. Know when to cut specialty cuts. Greenhouse Grower 9(3):80. (March). Armitage A.M. and J.M. Laushman. 2003. Specialty Cut Flowers. Second Edition. Timber Press. Han S.S. 1993 Handling Cut Flowers in Roadside Stands. Floral Notes 4. Han, S.S. 1993. Basics of Handling Cut Flowers. Floral Notes 5:8-9. Nell T.A., R.T. Leonard, and A.J. Macnish 2006. Taking the Mystery out of Flower Care Solutions. Florist Review Magazine. Prince, T.A. and H.K. Tayama. 1988. Preservatives and fresh cut-flower longevity. Bull. Ohio Flor. Assoc. 706:34. Reid, M.S. Cut Flowers and Greens. University of California-Davis. Schroeder, Kurt. 2006. The Cold Hard Facts. The Cut Flower Quarterly. 18(4):18. Smith, Gay. 2006. Summer Flower Care. The Cut Flower Quarterly. 18(3): 16-17. 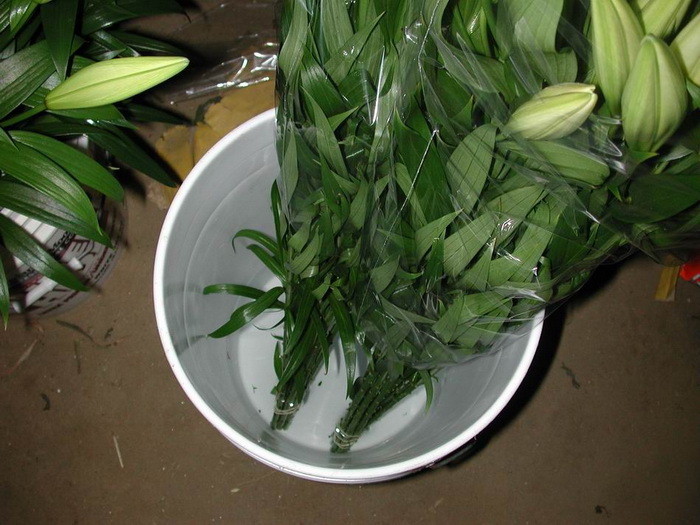 The Three C’s - - A check list for Optimal Postharvest Handling of Cut Flowers and Foliage. Nov. 1997. Perishables Handling Quarterly Issue No. 92 .